When Gene Luen Yang was appointed last year as National Ambassador for Young People’s Literature, he chose a platform of “Reading Without Walls,” which encourages readers to choose books that touch on experiences different from their own. Now entering the second and final year of his ambassadorship, Yang announced last week that “Reading Without Walls” will endure as an annual program open to schools, libraries, and booksellers nationwide! 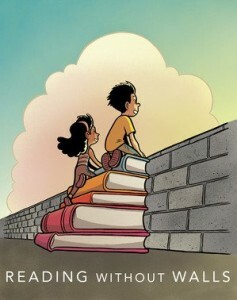 The idea behind “Reading Without Walls” is simple but powerful: challenge young readers to choose books about characters who don’t look or live like them; addressing topics they don’t know much about; or in a format they don’t usually read–such as a graphic novel, a book in verse, or an audiobook. The expanded initiative will launch in April, but the “Reading Without Walls” website already offers a free downloadable program kit including a certificate of participation, poster, writing prompts and puzzles, and a parents’ guide. Interested individuals can also sign up for email updates about the program. Librarians and educators looking to incorporate “Reading Without Walls” into their collections or curricula can also find a wealth of free resources from CBLDF, including our graphic novel discussion guides, Using Graphic Novels in Education, and the 2016 Banned Books Week Handbook, which centers on the theme of diversity. “Reading Without Walls” is sponsored by the Center for the Book at the Library of Congress, Every Child a Reader, the Children’s Book Council, and Macmillan Children’s Publishing Group. Watch Yang’s introductory video below, and get ready to expand some horizons!